Maggie Hassan, Ann McLane Kuster, and Carol Shea-Porter win: New Hampshire is for ladies. 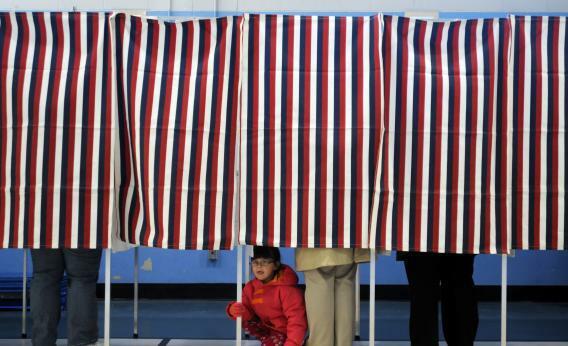 A young girl looks out from a voting booth as her mother casts her ballot in Manchester, N.H. There was little doubt that New Hampshire would elect Maggie Hassan governor Tuesday, making her the only Democratic woman governor in the nation. Nor was there much doubt that Democrat Ann McLane Kuster would win the race for Congress in New Hampshire’s 2nd district, joining the state’s lady Senators—neither of whom were up for re-election—in the federal delegation. The question was whether Democrat Carol Shea-Porter, a social worker who says she turned to politics because of her experience cleaning up after Hurricane Katrina, would win the other House seat. She did. New Hampshire’s leadership is now homogenously gendered, and not in the way we’re used to. Is this a good thing? What if they all meet up and their cycles sync and they get their periods at the same time? What if there is some kind of national emergency and someone has to rotate abstract shapes in her mind while parallel parking? What if a giant spider invades and there is no one to kill it? Whatever your concerns, I will submit that this is a big deal, and maybe not as unlikely as it seems in a Congress that was only 17 percent female on Monday. You’d expect women candidates to cluster not just in places where they’re welcome but also in places where other women have shown that it’s possible. Now we can sit back and watch the lady-love spread to more benighted states, which is to say all of them. Or, alternately, watch New Hampshire burn to the ground.